In our unending quest in the search for brilliant boozes (bought/homemade/whatever) we have encountered many drinks subscription services. Some promise bulk ordered, bargainous booze, others offer regular streams of small volume, high quality beverages with the booze connoisseur in mind. The Decanting Club sits in the latter category – a crowdfunded startup who aim to sniff out wines made by small producers that champion local traditions. 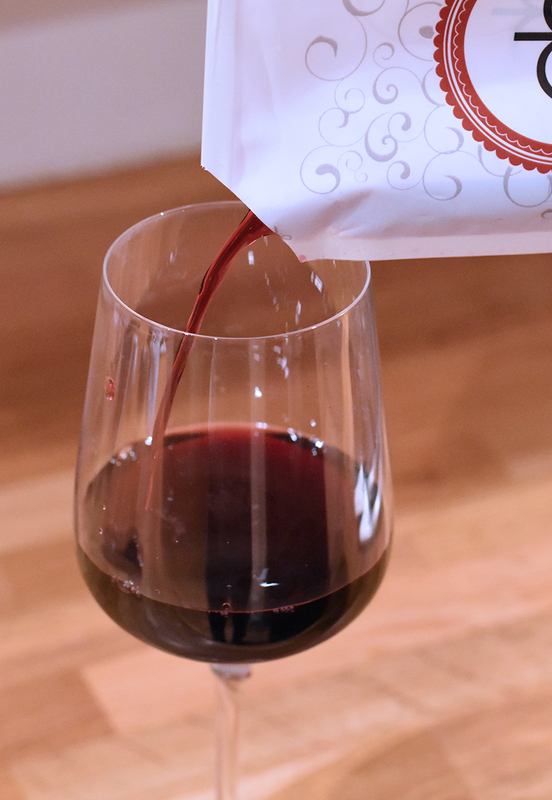 Said fancy boozes are then delivered to the consumer via the DC USP – plastic wine pouches. It’s an inspired delivery method for sure. Not only do slim plastic pouches slip nicely through your letterbox, therefore negating the need for you to lie in wait for the postie and sign for a bulky package*, they won’t make that terrible, bottle rattling sound as you take them out for recycling, alerting the neighbourhood of your shameful boozy indulgences. A result on both fronts. For trial, we were sent a couple of pouches containing a Clip Loureiro Vinho Verde from Portugal and an Adalia Valpolicella from Northern Italy. Both wines are from small organic producers – the Vino Verde being a lip-pursing acidic number, and the Valpolicella a light, spicy and easy drinking red. All a bit too easy drinking to be honest, making the 150 ml pouches seem a bit miserly on the serving front, leaving us wheezing for another glass of tasty grape-based** booze. There’s a choice of subscriptions – for £10 you’ll get 2 x150ml pouches poked through your letterbox per month. Go for the £25 option and you’ll receive 1 x 150ml a week, and for £39, 2x 150ml sachets per week will be hurtling their way to you. When compared to some of the bigger booze subscription outfits, the Decanting Club offering seems a tad pricey, especially when you factor in the savings they make from delivering booze in pouches rather than glass bottles. You do, however, get the impression that each wine in their bulging portfolio has been hunted down with gusto and curated with care. Subscribers also receive tasting cards for each booze supplied and – best of all – each wine is accompanied by a video tasting tutorial, accessible via the Decanting Club website and hosted by wine expert Steve Evans. He’s a kind of macho John Inman/camp Kurt Russell who talks knowledgeably and flamboyantly about the wine he’s throwing down his neck. He’s a captivating watch and no mistake – a swashbuckling wine wizard who deserves to be on proper TV and enjoyed by the masses. Or at the very least, Sunday Brunch. The Decanting Club looks like a decent way of experiencing new wines in short, sharp doses. We are not unaccustomed to the pleasures of supping on fine wines, but we often fall into the ‘supermarket trap’ – a deep, ingrained mental conditioning that makes us grab ‘anything under 6 quid with a nice label’ whenever we stray too close to the Co-op chiller cabinet. A subscription to the Decanting Club would help open our eyes to the wider winey world. For subscription info, visit The Decanting Club website. Here. * Beware the ‘ring and run’ tactic, utilised by numerous courier services whose employees – pressured to deliver unrealistic targets and pushed for time – don’t want to hang around waiting for you to pull on some trousers/get out of bed /walk five steps before answering the door. And while we’re on the subject, my dad used to be a postie and told me that some of his colleagues used to fill in ‘we called, you were out’ cards BEFORE going out for delivery, so they didn’t have to carry heavy packages down long garden paths. IT’S A NATIONAL DISGRACE! ** We’re good for non-apple based wines, thank you very much. In fact we’ve got over 50-odd bottles of various veg and berry boozes left over from our ‘Brew it Yourself’ experiments festering maturing in the brewing shed. The post The Decanting Club Review appeared first on Two Thirsty Gardeners.